RealClimate is a commentary site on climate science by working climate scientists for the interested public and journalists. We aim to provide a quick response to developing stories and provide the context sometimes missing in mainstream commentary. Looking back, we think we’ve done well on both these goals. We have provided the most, and the most accessible, context on topics like climate sensitivity, GCMs, attribution, paleo-climate than any other site, with an exception only for the IPCC reports themselves and other assessments, while engaging in depth with commenters from the interested public, journalists and other scientists. We haven’t led the response to every developing story on climate science (an impossible task), but we did where it mattered. Our rebuttals of shop-worn contrarian rhetoric built off experiences on USENET and at Tim Lambert’s Deltoid, and have now been enhanced further at places like SkepticalScience.com. When we started, there were a number of motivations: the desire to have a site where scientists communicated directly with the interested public on issues arising from the “The Day After Tomorrow” say, or provided rebuttals to misinformation as the “The Panda’s Thumb” did for evolution science, or just to write down background we gave to journalists so that we didn’t have to repeat ourselves. But the impetus to keep this going has been a continued desire to elevate the level of conversation on climate so that people could get a sense of what the real issues in the science were, as opposed to arguing about irrelevancies. To our surprise though, one of key audiences has always been the wider scientific community and other climate scientists themselves. In retrospect this should have been expected. “Climate science” as a topic has grown a little like the Borg – assimilating fields that were loosely connected (oceanography, meteorology, atmospheric chemistry, geology etc.) which over time have become far more connected. This has meant that many people who started out as different kinds of “-ologists” now find themselves being asked questions, teaching and writing about climate. It’s understandable that ecologists might not have learned much about stratospheric chemistry in their training, or that synoptic meteorologists wouldn’t know much about paleo-climate, or that field scientists don’t know much about GCMs. RealClimate has played a big role in bringing these diverse groups “up to speed” on the shared concepts of climate science. Of course, there are still plenty of know-nothing op-eds from people who’d really prefer the science not to exist, and many loud and misinformed commenters elsewhere on the web; but, in contrast, there have been countless people who have thanked us for providing more background on the issues and for engaging their questions. To be sure, there were times when it all seemed like nothing had changed. RealClimate has had a noticeable effect on our scientific careers. We would argue that it has made us better communicators (our early posts are much less polished then ones now) and it certainly increased our public profiles in both positive (e.g. the inaugural AGU Climate Communication Prize) and negative ways (FOIA lawsuits to access RealClimate emails). It has even driven our research in cases where we found that there wasn’t much literature on questions that came up here. Over the last ten years we have (in our opinion) got better at running a blog, and indeed, at writing for them. To start with, we didn’t envisage there would be quite as much interaction as we ended up with and this brought up a host of issues for how to handle it. Firstly, we have always (and unapologetically) moderated the comment threads. In our opinion this remains essential for curating an interesting and substantive conversation. It took us a while to realise that a continuously available ‘Open Thread’ (the first one was in Jan 2011) was a really good way to keep other threads on topic which was a perennial problem. At that same time, we started a “Bore Hole” thread to dump the more tedious of the troll comments – this too was something we should have done from the start to increase transparency. One thing we did from the beginning was set up a system of internal peer review among the group for all the substantive posts. While on rare occasions there was disagreement on what to say (and more commonly, how to say it), overall this has been a huge boost to getting the science right, improving the writing and setting the tone. Another excellent idea (and it might even have been a novelty) is to respond to questions and comments “inline”. This has been very helpful in building conversations and effectively interacting with readers without a sprawling mess of threaded comments, and remains a highlight of the comment threads. Our responses are often pointed, though hopefully sometimes amusing, as well as being informative, though on occasion we let frustration get the better of us. Looking back over the hundreds of posts, the breadth of science covered by the contributors (including the guest posts) has been huge. Some of the content was very specific to ephemeral issues that now seems a little quaint, but a lot of the content stands out clearly as worth referencing still. The relevance of critiques of particular idiocies from Fred Singer or an obscure article, while valid, has faded, while general posts on attribution, paleoclimate, climate sensitivity and the surface temperature records remain interesting even years later. Overall, we think we have much to be proud of and that the sometimes enormous amount of time spent on the site was (almost all) worthwhile. We are however very interested in what you, the readers, think about this. If you have always lurked and never commented, please let us know why. If you think we’re wasting our time, again, let us know (politely please!). If you have learned anything interesting here, from either the posts or the comments, please tell us what. In three follow-up posts we give some of the numbers on what RealClimate has done, a big shout out to the people who’ve contributed and later this week we’ll discuss what happens next. I just started digging around here today after reading Mann’s “The Hockey Stick And The Climate Wars.” Just popping in to thank people like you for the work you do (Mann’s book made me aware how awful the abuse can be.) I’ll definitely keep a lookout for new articles here in the future! I have been feasting on your incredible content for most of the past 10 years and am commenting now for the first time to say RealClimate is my Go-To place for climate information. I am lucky enough to work on climate change programs in California, and we are all so lucky to benefit from your good work. I have learned a lot. For me this is highest praise. Congratulations and my heartfelt thanks. You’ve all taught us so much climate science and much much more. Your generosity of time and spirit is truly inspiring, as is your endless patience. Wishing many happy returns of the day for realclimate.org and all of you. It seems like the number of articles produced has dropped off quite noticeably. Not sure if it would be possible to get more guest authors but would be nice if there was an article or two a day. Cheers. RealClimate is always a great start when you have a climate related question, and I really like that this site offers a way to get direct feedback from the experts. Thank you. I really appreciate the efforts you have all put in. You have been the “go to” guys when I needed to reference some science in the battle against the BS. Big thanks for all the work you’ve put into this! One little thing: Skeptical Science is .com, not .org. Thank you all ! Writers and commentators. No other site with so much helpuful and correct information. RealClimate has done a superlative job. So has SkepticalScience. And yet you and your many supporters (like me) have failed to significantly influence the general public. The general public includes most of my relatives so I feel it acutely. In the case of my relatives brain waves cannot get past the religion barrier. Neither you nor SkepticalScience have the venue to work that aspect of the problem (similar venue issue for the die-hard “we should all hate government” people). The world needs a better venue working that side of the general public and more of us who are not publicly tied to vulnerable science reputations or government positions need to work better-smarter helping those venues. But the foremost problem is where are those venues? That part of the general public will not communicate with even Skeptical Science. I can’t imagine a solution other than the world will get to the edge of the cliff where a breeze may blow us over. Any good ideas out there?? Yes, I am one of those that never comments, but always reads. Sometimes, the posts are beyond me, but I try to struggle through the data and information. Your site continues to expand my knowledge of the climate and the interactions of all the systems. Your site is the standard for the science on climate. Thank you a million times over. Been following this space for a number of years now and just want to say how thankful I am for the collective time and effort that has been spent on maintaining it and informing the public. I follow a number of climate science blogs and this one is irreplaceable. Hope to see much more to come! If you are not a writer, commenting on general news sites is an option. There’s always lots to refute–though it’s a bit like Hercules’ labor of cleaning the Augean stables, which might seem quite like speaking with some of your relatives. But I think that online activity, though probably useful, is not the most important. Probably the most important is making personal and organizational connections with other activists. There are a lot of ways to do that; churches are actually good venues, as many have social justice committees or something similar. Climate change, which from one perspective amounts to the present stealing from the future, is nothing if not a social justice issue. It was with help form Realclimate that I wrote two novels in response to Michael Crichton’s State of Fear. Warm Front is dedicated to the aforementioned scientists. Salud! In the case of my relatives brain waves cannot get past the religion barrier. Do your relatives consider themselves Evangelical Christians? If so, perhaps you can buy them a copy of A Climate for Change: Global Warming Facts for Faith-based Decisions, by atmospheric scientist Katharine Hayhoe and her husband Andrew Farley, an evangelical pastor. If your relatives don’t want to read a book, videos of Hayhoe speaking can be found all over the Internet. As for myself: if it wasn’t for RealClimate.org, I’d probably spend more time at my job, but I wouldn’t be getting a first-rate education in climate science. Keep up the good work! RealClimate was one of the reasons for starting the Arctic Sea Ice Blog. I’ve learned many things here, not just about climate, but also about science in general, and online debating. Which is why I want to thank, not just the people behind RC, but also the many knowledgeable commenters. the point -I think – but as a reference point Realclimate takes some beating and forces the doubters to step back a bit. I follow this site since many years, and it has been incredibly useful. Not all posts, not all time, but overall, an extraordinary public good. I will join many in offering my heartfelt thanks for all you do here. As a retired earth science instructor, I truly appreciate this blog. I have been reading it for a number of years, and appreciate the effort you folks make in maintaining it. The (mostly) constructive dialog is something I make it a point to review each and every day. Well done, Gentlemen! I always turn to your site first. That has been my practice for at least 10 years. As an octogenarian, much of the content is is challenging, but I have learned a lot from it, and I have confidence in the veracity of the content. Thank you. It’s been great having you folks around. We may be loosing the battle, but you folks continue putting up the good fight. That means a lot in itself ! Hope you don’t mind me taking Sou’s lead and shouting my appreciation from the virtual rafters. Like many of your readers, for many year I have tried to read every post. Thank you for attempting to inform those of us who aren’t mathematicians, statisticians or physicists so we can understand the science of climate change. I had suspected the planet was in trouble. Now I am sure. Future climate change is predictable. Through RealClimate my understanding of human collective behaviour has also changed. I’ve been following global warming since seeing Soylent Green in 1973. I got much more serious in looking at the science of climate change in the 1990s when I realized how the wildlands I spent my life protecting would be drastically threatened by these changes. Real Climate allowed my understanding of the complex issue of climate change to make quantum leaps forward. Thank you all for taking all the time, effort, and energy to maintain this website and inform the world. Though if you read beyond the headline finding, there’s lots of educative work to be done. And time, of course, is a big issue. Hopefully, the COP talks will be productive. I appreciate how RC makes the science so accessible to us laypeople, and how you don’t take any BS from the denialati who post here. Hopefully, it won’t take another 10 years of your stellar efforts to get the message across to all the anti-science numpties out there, most of whom refuse to accept the mountain of evidence for AGW on ideological/tribal grounds. But I suspect, as you must also, that it will be Nature that sooner or later forces them to change their minds. She always bats last. This is my first time commenting. I want to say a big thank you for your work. I was actually vaguely sceptical, not particularly alarmed before the CRU hack. After that, I decided to investigate more deeply, and you were a large part of my education. I am actually a geeky math kind of person, and I appreciate the non-dumbed down approach (and Tamino). I am also glad that you moderate heavily, and borehole the trolls. Most internet comment sections are unreadable. Thanks so much for 10 great years. I have not commented because, as an economist, I am a consumer of physical science content. I have followed this site from the beginning. I have used the information in my job as a policy analyst for the Oregon Dept. of Energy (ODOE). I have and continue to work on climate policy for the State of Oregon since 1990. To me the value of the site has been primarily as a place to find or understand late-breaking climate science. Our agency subscribes only to the journal Science (AAAS). We don’t have the staff time to scan the large and growing number of other journal articles on climate science. I have used knowledge gained from this site in ODOE publications and testimony. I have given numerous public presentation both for ODOE and as a citizen. This blog has helped increased the accuracy and effectiveness of all these efforts. I know that similar efforts by many state and federal policy analysts, as well as non-governmental staff and citizens, have been more effective as a result of this site. You have no idea how much good you have done. 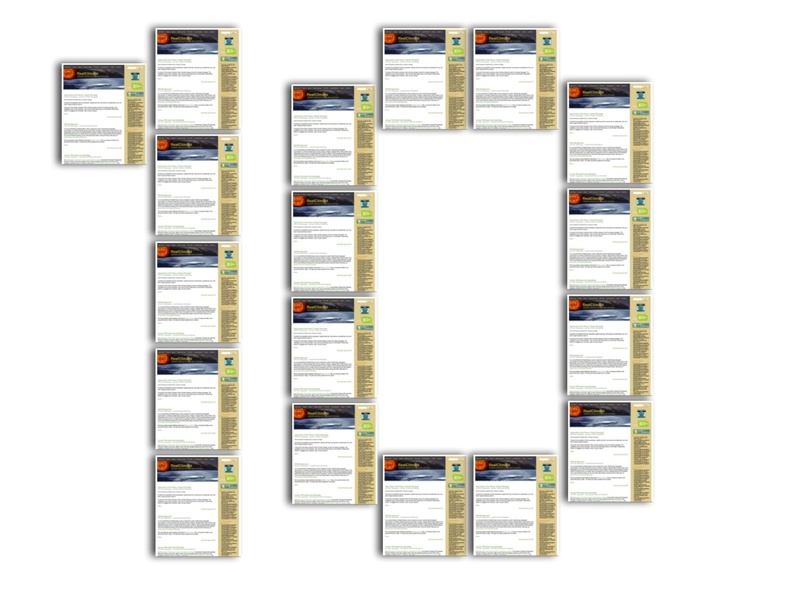 I’m so grateful to everyone who has put so much work into this excellent website for the last 10 years. I started taking an interest in climate science around the time of the CRU email hack. Without all your efforts and without the steadfast patience and integrity on display here, I’m not sure I would have ever found a way to see fake/misguided skepticism about AGW for what it really is. It’s such a privelege to have a site where we can pose questions to experts and get answers that really help move our understanding forward. The challenge for me is to use what I’ve learned here and at other helpful climate science websites, and to start trying to wake people up to the threats that climate change poses; as a civilisation we still seem to be sleep-walking towards very serious (and still at this stage largely avoidable) problems, and I don’t believe political leaders will really take meaningful action until there is strong pressure from the people to do so. Real Climate tells it like it is. Keep up the good work. Basically, policymakers and “energy experts” are having discussions that are disconnected from what climate scientists say. The scientists are indirectly represented by “green groups”, such as EDF in this case. But if you listen to EDF, you would think the only problem is fugitive methane emissions… the CO2 emissions from burning natural gas seem to be fine to them. The bottom line is that while is is not climates scientist’s “job” to discuss climate policy, the folks whose job it is, don’t seem to understand the gravity of the situation. Many thanks to all of you at Real Climate for helping to educate me in climate science. Discovered you in 08 and was sufficiently motivated to join a Christian Aid bike ride from Essex to Copenhagen for the 2009 conference, and several other campaigns since. Read The Long Thaw and as much technical background as I could. As others have said, there are many good sites now aimed more at the newbie, but nothing quite matches the scientific. professionalism found here. We still need you guys! Pretty much everything has been interesting! What did I learn here? Too much to remember. The optical properties of GHGs and the notion of (Gassy I and II) saturation, the role of water vapour and its function as a feedback (not forcing), ice age forcings and feedbacks, understanding and uncertainties on hurricanes, ocean/atmosphere oscillations, the tropical tropospheric ‘hotspot,’ climate models (FAQ posts I and II were great), methane and permafrost, clouds, aerosols, ozone, cosmic rays and climate change (or not), the carbon cycle and the lines of evidence for anthro source, ocean acidification, sea level, sea ice, the perils of geoengineering, model obs comparisons, millenial reconstructons, the hockey stick brouhaha and the science behind it. I learned about the peer-review process (necessary but not sufficient), the IPCC process, and I read the takes on the CRU emails. That’s just the articles – there has been plenty to chew on in the comments. Nearly forgot to mention all the posts directly rebutting popular ‘skeptical’ views as they arose. 7 years ago that would have been my first thought, when climateball was the main game. But curiosity has overcome competitiveness. Thanks partly to you. RC was never a one-stop shop, but the best place to get a balanced view was here, even if I didn’t think every post was was absolutely neutral. Coby’s original blog linked me here in the first place. If you have always lurked and never commented, please let us know why. I rarely post because I often feel that my questions are too junior, or too specific to a topic that only I am interested in while another conversation is going on. The rare occasions I’ve posted I’ve tried hard to be clear, but grasping at the edge of understanding difficult topics, I don’t think I’m informed enough to even frame the question properly, or at least in a way that would invite interested comment. Not too proud to be a petitioner rather than a contributor, I just don’t want to waste people’s time with pet interests. No problem asking basic questions on ongoing topics, but the exposition has usually been clear enough that no questions are required. You’ll never know how much you helped or inspired the lurkers, but you can be confident that you amply provided the means. Many thanks and congratulations for making the science on a host of topics accessible to lay people, and for defending science in general. I have relied on RealClimate for 10 years – as a researcher, teacher, and AAAS Congressional Science Fellow. I always refer fellow scientists, interested laypersons, and especially climate deniers to the site – sorry if that last group causes headaches in the comments section, but I can’t imagine a better forum for getting the latest information and well reasoned interpretation out there. I can’t thank you all enough for this enormous service, as well as for being pioneers in newer forms of science communication. This latter service has indirectly benefitted scientists way beyond the climate fields. I have been reading RC since the beginning (or close enough to it), but never comment. Usually someone else has already asked my question. Keep up the great work!